many people know, that the surcharge on Skype, you can use a very useful services. About tom, how to make this board, we discuss in this article. novice users, do not have electronic wallets, recommended make payments via their credit card. If the credit card you do not have, you can put money on Skype through one of the most basic services: Yandex money. About tom, how to sign up in this system, you can learn more on page money.yandex.ru. If you have a mailbox on Yandex, the registration procedure is considerably faster: only need to enter additional information and to become the owner of the electronic wallet, with which you can pay for Skype. Replenish the purse balance is possible either by bank transfer, or purchase a special card, which are sold in the mobile phone stores. Select the currency and the amount and press Continue. Pay attention to the function of automatic account replenishment: when the money in the account will be terminated, account will be replenished automatically. You will be redirected to the payment page. Enter the credentials of your wallet and make a payment. 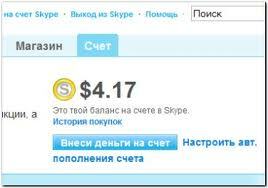 After some time, the money will appear in your account Skype. If something did not work, or money deducted from the purse, but not credited to the account, contact Skype Support.